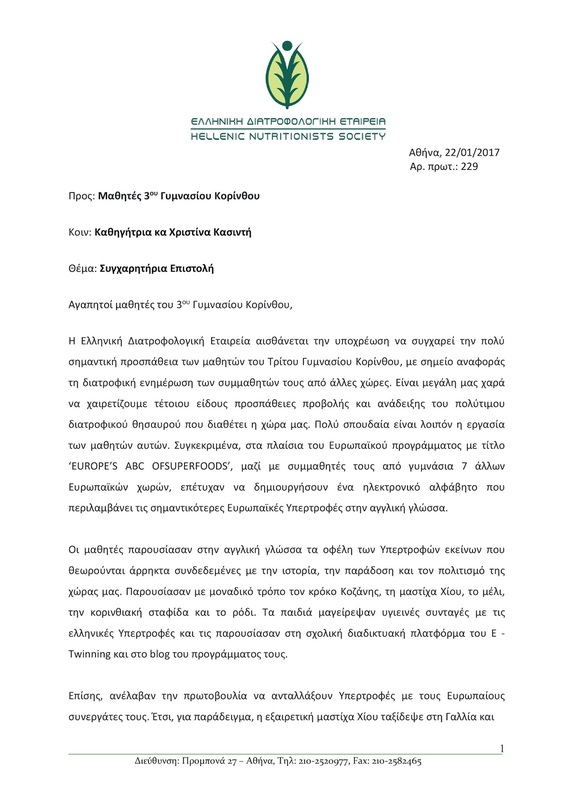 EUROPE'S ABC OF SUPERFOODS: The Hellenic Nutritionists' Society Letter of Congratulations! 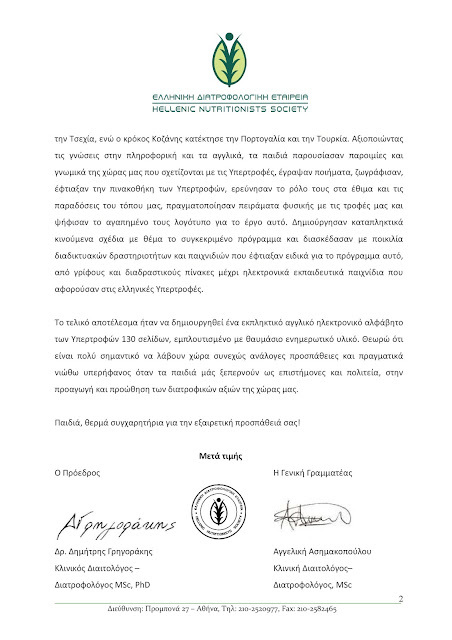 The Hellenic Nutritionists' Society Letter of Congratulations! We are so proud and happy!We have just received a letter of congratulations on our project from ELDE, the Hellenic Nutritionists Society, and their president, the distinguished Greek dietician Dr Dimitris Grigorakis. 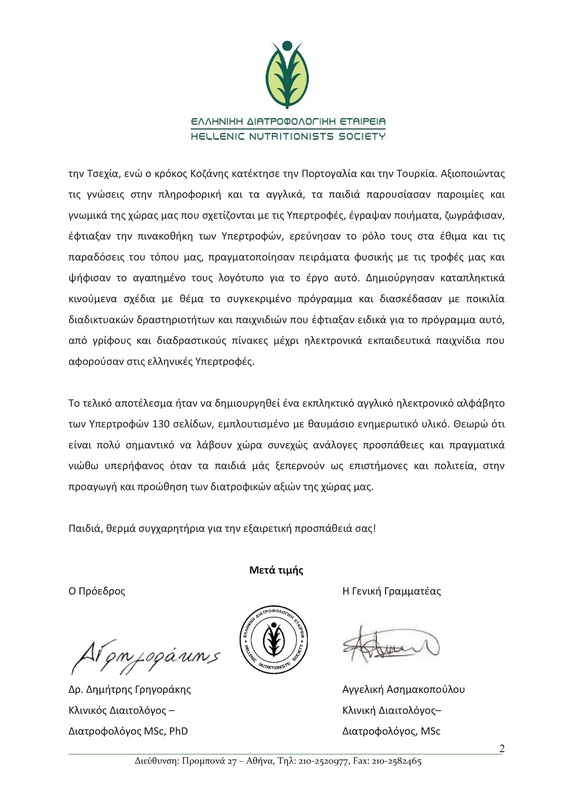 The Hellenic Nutritionists Society feels the need to congratulate the students of the 3rd Junior High School of Corinth on their very important work, with reference to the nutritional information of their peers from other countries. It is our great pleasure to highlight such efforts to promote the valuable nutritional treasure that our country possesses. Very important is, therefore, the work of these students. 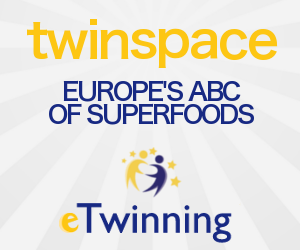 Specifically, within the European project called 'EUROPE'S ABC OF SUPERFOODS', the Greek students, together with their peers from seven high schools in other European countries, have succeeded in creating an online alphabet that includes Europe's most important Superfoods in English. The students presented in English the benefits of the Superfoods that are inextricably linked to the history, tradition and culture of our country.Thus, they presented in a unique way the Kozani crocus, the Chios mastic, the honey, the raisin and the pomegranate. The children cooked healthy recipes with the Greek Superfoods and presented them in the eTwinning online platform and on their project blog. crocus Kozani 'conquered' Portugal and Turkey.Making good use of their knowledge in ICT and English, the students presented the proverbs and sayings of our country associated with Superfoods, wrote poems, created paintings and the gallery of Superfoods, researched their role in the customs and traditions of our country, made scientific experiments with Superfoods and voted for their favorite logo for this project. They created amazing cartoons and had fun with a variety of online activities and games made especially for this project, from puzzles and interactive whiteboards to online educational games, including the Greek Superfoods. The final result was to create a stunning online English alphabet of Superfoods of 130 pages, enriched with wonderful informative material. I think it is very important that such efforts take place continuously and really feel proud when children surpass us, the scientists and the state, in promoting the nutritional values of our country. Children, congratulations on your achievement!